Greetings from the farm! There’s a sense of urgency now that the temps have come up. The Sugar Snap peas are “up” in more ways than one—we suspend the trays above our greens in the greenhouses every Spring so that hungry critters don’t devour them before we do. And beyond the peas, there are all kinds of greens and beets and things that are going to want to be out of trays and into the soil before we know it. Since it was time to make a little more room in the field, Mark and Luis dug the remaining bed of Parsnips today, making way for an afternoon of plowing and forward momentum. Like us, our friends Amy and Agustin of Four Elements Farm were looking to move some of their overwintered baby Collards this week. Ours are looking pretty tasty as of this morning too, so with our powers combined, we’ll have some overwintered leafy greens on the table this week. I love quick sauteed Collard Greens—they’re like Cabbage’s robust cousin that can hold up to all kinds of flavors—pepper, vinegar, ginger and peanut. Yum! 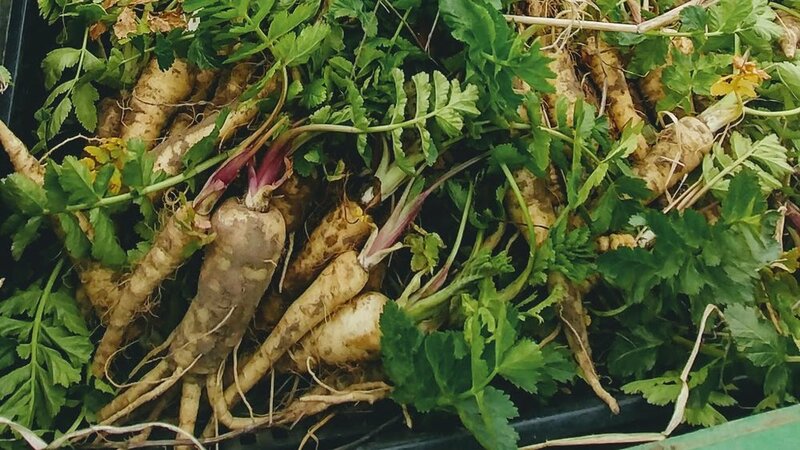 Meanwhile, Parsnips are one of our more covetous root vegetables this year. They look like creamy white carrots, but their flavor is sweeter and more intense than carrots. And like so many things that have overwintered, they taste extra yummy this time of year. My rule of thumb still holds true in late March—a little of frost and a bit of heat make hardy vegetables nice and sweet. So whether you turn them into oven fries, or grate them up into a breakfast hash over the weekend, I hope you’ll find them a delicious treat. Baby Collards—almost too pretty to eat…almost. A seedling’s eye view of the hothouse from the weekend: Lunchbox Peppers, Chiles, Tomatoes, Eggplant, Tomatillos almost ready to pot up.